See Soundwave. Soundwave sad and old. 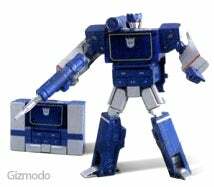 Soundwave only have cassette in belly. See Gizmodo. Gizmodo likes shiny new things, but also loves the past. Gizmodo hears reader, (Big shouty outy to Asymptotic, if you're still there, hope so) suggest Soundwave should be dragged, kicking, screaming, and transforming, into the 21st Century. MP3 player, say Asymptotic. Rip out um cassette-thingy and replace with SD memory card slot. Will be popular. Will be loved. Will be put on mantelpieces by Transformer-loving geeks everywhere. And Lo! And Behold! And Bloody Hell, we're gadget psychics. Round of applause to Asymptotic, please.